On this day in 1983…..
Weird Al Yankovic’s first music video hit the airwaves. The video was for his song “Ricky” – a parody of Toni Basil’s “Mickey” – and poked fun at I Love Lucy, with Weird Al as Ricky and Tress MacNeille as Lucy. 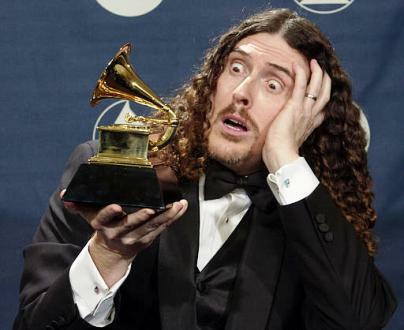 Weird Al Yankovic was born Alfred Matthew Yankovic on October 23, 1959 in Downey, CA. The only child of Nick and Mary Yankovic, Weird Al grew up in Lynwood where he went to Kindergarten early and skipped the second grade all together. Weird Al Yankovic is an American singer, musician, actor, satirist, parodist, songwriter, music producer, accordionist, and television producer. Yankovic is known in particular for his humorous songs that make light of popular culture and that often parody specific songs by contemporary musical acts. Since his first-aired song parody in 1979, he has sold more than 12 million albums—more than any other comedy act in history— recorded more than 150 parody and original songs, and has performed more than 1,000 live shows. His works have earned him three Grammy Awards among nine nominations, four gold records, and six platinum records in the United States. Yankovic’s first top ten Billboard album (Straight Outta Lynwood) and single (“White & Nerdy”) were both released in 2006, nearly three decades into his career. Yankovic married Suzanne Krajewski on February 10, 2001. Their daughter, Nina, was born February 11, 2003. They also have a pet cockatiel named Bo Veaner. They used to have a pet poodle, Bela (pictured atop Yankovic’s head on the cover of his album, Poodle Hat). Despite songs such as “Pretty Fly for a Rabbi”, his frequent use of “Oy vey” and other Yiddish phrases, Yankovic is not of Jewish ancestry, and identifies himself as a Christian. previous post: 2009 Grammy’s Round Up – Better Late Than Never.